Police and Fire Erie Lake Line Erie Bands & Ball Teams Safety First! This page presents information of use to individuals researching ancestors/relations who worked for the Erie Railroad. The primary data source is the company's "Erie" magazine. The time period covered here is mainly Erie - from the early days (circa 1851) through the first two years of the Erie-Lackawanna merger transition. The only way that this site can continue to expand is with the help of people who hold employee rosters, photos and other sources in their collections who are willing to contribute their information to the project. For more information on the Erie, check my Links page. I have also included links to several Rootsweb message boards of interest to people doing Erie employee research. I would also like to challenge others who have ancestors who may have worked for other railroads to consider doing something similar to this page. My inspiration for beginning this project came from Fred Veregge's Frisco Railroad Site. Perhaps we can inspire someone else to take up the challenge! I continue to search for other private sources of records. One source that can't be overlooked as a commonly available substitute for personnel records is the railroad's "Erie" employee magazine. This magazine was published from 1905 to 1960 (and continued to be issued as the "Erie-Lackawanna Magazine" after the 1960 merger with the Delaware, Lackawanna and Western Railroad), and the issues I've seen really point out the pride the railroad had in its employees, and vice-versa. Contained in the magazine along with news on employees from each division are tables of employees who have recently retired or passed on, along with years of service and position titles. The Magazine also carried news on the personal lives of employees, celebrating the weddings and births and grieving the losses. It fleshes out the lives of these railroaders in ways that personnel records or seniority rosters often don't. A word of thanks to those who have contributed data to this project, who include Robert Bahrs, John Belding, Douglas Crosby, Tom Delaney, Carl Freshour, Emily Homer, Jeff Hulse, Rich Johnston, Greg Kash, David Larkin, Sarah Lynne, Patrick McKnight of the Steamtown National Historic Site, Jay W. Noyes, Nick Pappas, Richard Palmer, Mark Schmitt, Curtis Springstead, Mary Kay VanSkiver, Floreda Varick and many others. I would also like to acknowledge the considerable assistance provided by the Salamanca Railroad Museum Association in moving this project forward. MANY ERIE MAGAZINES NOW AVAILABLE ONLINE! The folks at Railfan.net, chiefly J. Henry Priebe, Jr., have placed a collection of Erie Railroad Magazines online in Adobe Acrobat PDF format. Thanks to Henry's vision, this was the first online archive of railroad employee magazines ever and is a valuable resource. 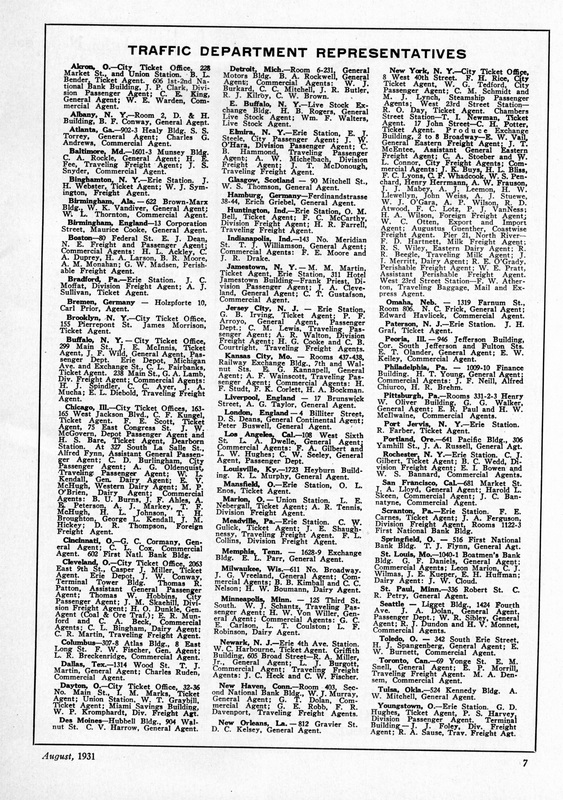 The following files represent a reasonably comprehensive index of individuals who were identified as Erie employees in the pages of Erie Magazine. 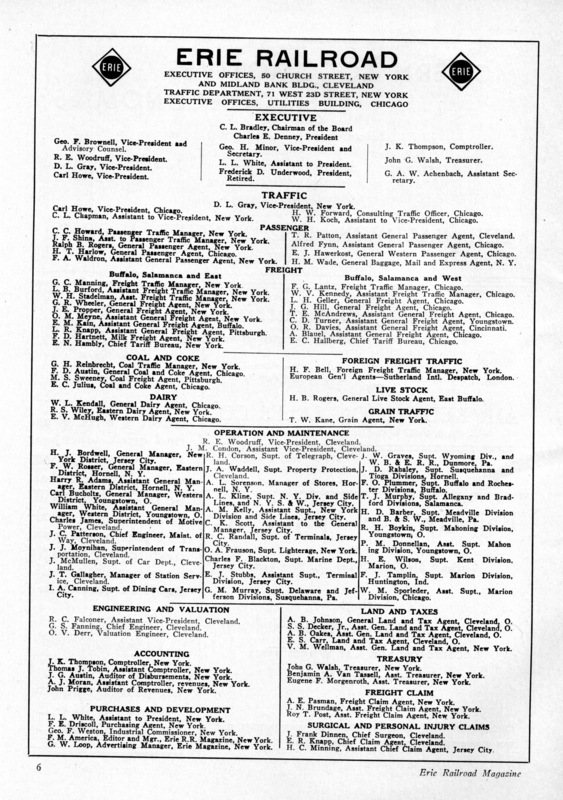 To date, I have included in the index data from all 668 issues of Erie, as well as some issues of the successor Erie Lackawanna Magazine. I have also tried to categorize the reason behind each reference in the magazine, such as "Promotion," "Obituary," "Transfer," etc., and have included a brief summary of the pertinent details of as many references as possible. My special thanks to the Salamanca Railroad Museum for making their collection of Erie Magazines available for indexing, especially to the late Jerry Fordham of the Salamanca museum for his many years of encouragement and help. For the future, my hope is that this will become a master index containing all references currently found on my site, including rosters. Toward that end, I have recently begun adding items from historic newspapers (including the Port Jervis Evening Gazette, Marion Daily Star, Hornellsville Weekly Tribune and Mansfield News), found online through the Ancestry.com Historic Newspaper Collection. Many of these items are from the 1870s to 1920s and take the information available here back an additional 30 years. Employee rosters are common among railroads, as they were union shops that contractually relied on seniority in job categories to determine job assignment, work or layoff status. The official seniority dates were determined and maintained by the railroad. The various divisions or shops would periodically publish ordered lists of their employees. In addition, printing companies would also publish lists of names along with advertising from local firms. These "advertising rosters" may not have been official, but the source of information was the same as the official rosters. Due to the many rosters that have been contributed to this site, the rosters have been moved to a separate page. Click here to go to the Rosters Page. "Some 4,300 men and women who had spent most, if not all, of their years of railroad service with the Erie Railroad were receiving retirement annuities from the Railroad Retirement Board at the end of 1950. These employes were drawing $365,000 monthly, or $84.87 each, on the average." The Railroad Retirement Board, which is the "Social Security" of the railroad world, may have information on the careers of many railroaders listed on this site. The RRB will search and copy its records for a fee. It's helpful to have a Social Security Number for a retiree when approaching the RRB - the Social Security Death Index may be of help, although access to that information has gotten more restrictive. Note that the RRB does not have records earlier than 1937 (although they may have abstracts of careers for employees receiving company pensions before the advent of the RRB). Also, some records are held by the National Archives and Records Administration (NARA), including work the RRB did early on to establish prior service records of employees. RRB will make the referral if NARA holds records that may be of help. An index is available online for these earlier records from the Midwest Genealogical Center. Prior to Railroad Retirement, the Erie had enacted a policy in 1907 that required train and engine crews to retire from active service at age 70 - those who wished to continue working would be given less strenuous work such as crossing watchman, or might receive a pension from the company. 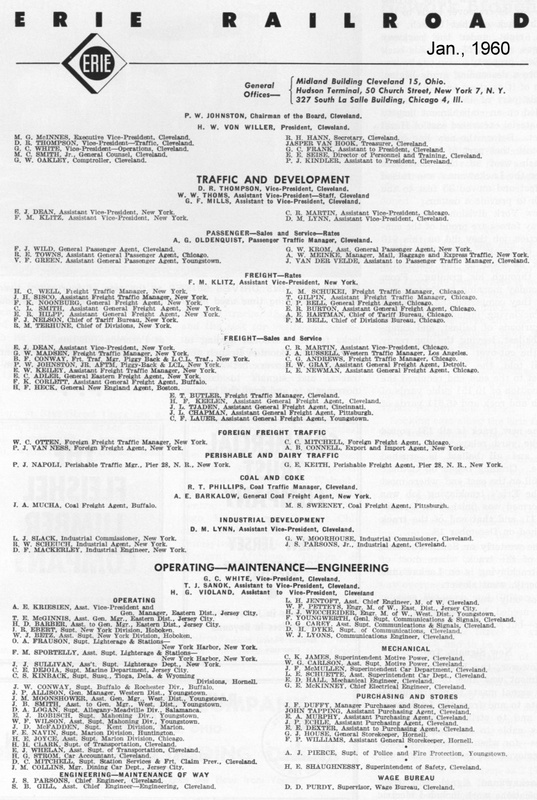 The job titles listed in the databases were fairly common across railroads, as they were covered by operating agreements between various unions and the railroads. Here is a link with a good summary of railroad jobs as presented by the Union Pacific Railroad. For a look at general job duties for engineers, conductors, section gangs, station agents and telegraph operators on the New York and Erie in 1854, click here. Railroading also has its own jargon, taken to its humorous extreme in this accident report as told by a boomer brakeman long ago to veteran Kent Division engineer Harold Davis. A boomer, by the way, is a railroader who moves from railroad to railroad, often staying only a short time until a better opportunity arises elsewhere. During World War II, one-quarter of the Erie work force entered the Armed Forces. The Erie sponsored two railway operating batallions both active in the ETO. The wartime issues of Erie Magazine included coverage of furloughed employees active in the Armed Forces. 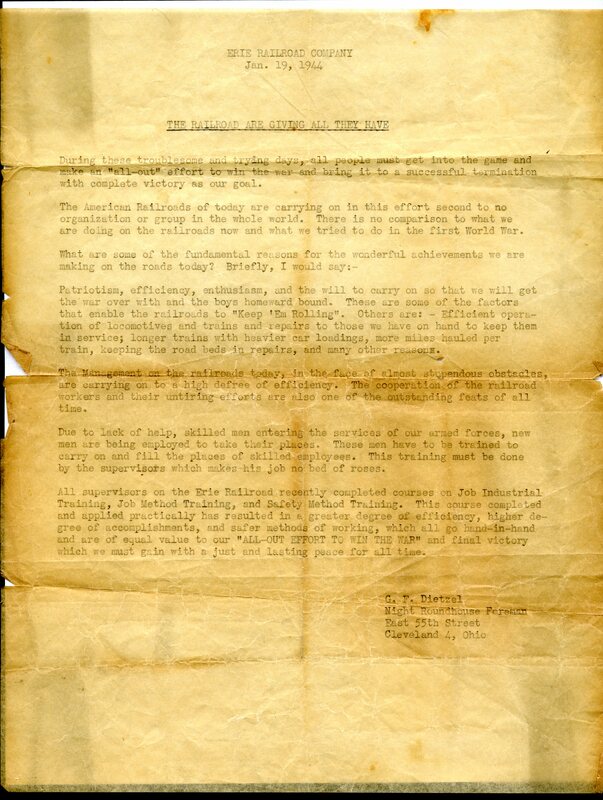 Coverage included photos, letters from servicemen, and service record summaries. The Erie was proud of the men and women in uniform and showed it in the pages of the magazine. The Interstate Commerce Commission has investigated serious accidents that have resulted in injury or death to employees or passengers. The reports resulting from the investigations present, often in harrowing detail, the events of each incident. Many of these reports are available online from around 1911 through the 1990s (reports available after 1946 do not contain names of employees involved). 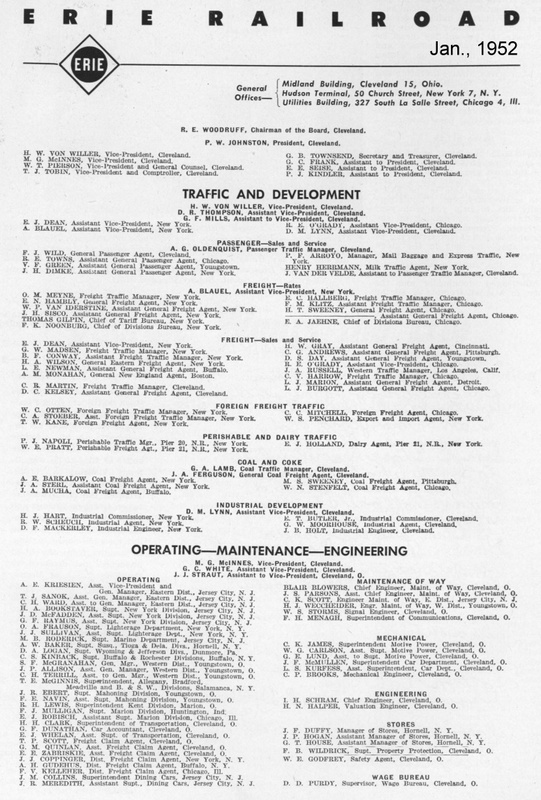 Names of employees are provided in these reports, but often only the last name (e.g., Conductor Smith). 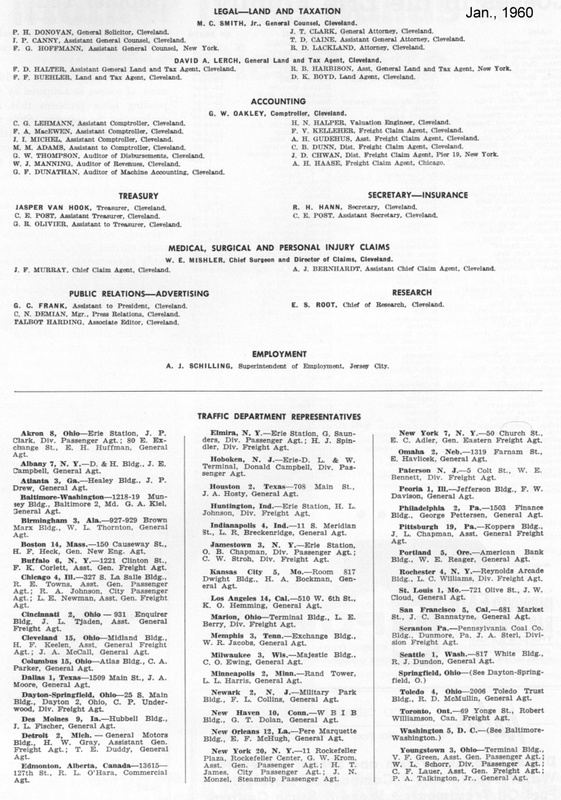 The index presented below contains data from the ICC database for the Erie from 30 accidents that took place between 1911 and 1941. Also included are other accidents mentioned in the pages of Erie Magazine. Additional research into any of these accidents (such as local newspaper accounts, or accident reports filed with state public service or railroad commissions) may yield more information, such as full employee names. The ICC database can be accessed through the DOT website. Click on "I.C.C. Historical Railroad Investigation Reports (1911-1990s)" for the search fields. Being a union shop for much of its existence, Erie employees can be found within the pages of the magazines published by the labor unions that represented the rank-and-file. These unions include: The Brotherhood of Locomotive Engineers; the Order of Railway Conductors; the Brotherhood of Railroad Trainmen; and the Order of Railway Telegraphers, to name just a very few. Many of the railroad operating, clerical and shop unions began to merge and reform as railroad employment began to dwindle beginning in the 1950s. Union records, like railroad personnel records, can be difficult to locate, especially earlier records. Some membership lists and meeting roll calls exist for individual locals in archives. 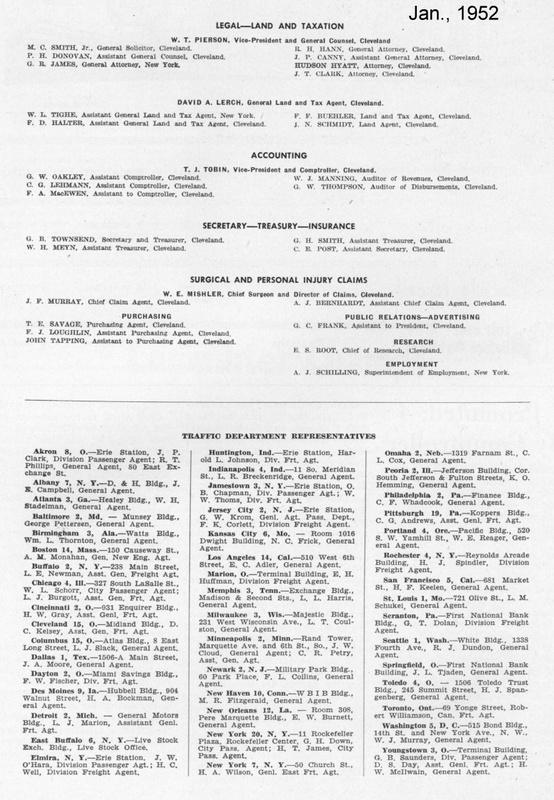 In addition, since many unions also had mutual benefit societies offering payments in the event of death or dismemberment, it is possible that some of those member lists or reports to members might also exist (click here to see a report of benefits paid to members of the Order of Railway Conductors in 1897, contributed to this site by Robert Heck). If anyone knows of union rosters or other lists covering the Erie, please let me know! With regard to union publications, I am not aware of any indexes that exist, even though many do carry news from locals listing member activities of the time, and a last-name index would be invaluable. This is a source that should be developed more thoroughly - any takers? RIGHT - Cover of the October, 1888 issue of the BLE Monthly Journal, scanned from a copy once owned by Erie engineer and BLE official Levi Linley. "For employees of the anthracite railroads of eastern Pennsylvania -- the Central Railroad of New Jersey, the Reading Company, Lehigh Valley, Erie Lackawanna, Pennsylvania Railroad -- the best information we have indicates that Conrail "inherited" most of the personnel records from these roads and that the records are stored in a secured facility. It is not uncommon for such businesses to seal such records for 50 to 75 years following an employee’s departure as a measure to avoid litigation should personal/personnel information fall into the wrong hands. This practice is protected under the Privacy of Information Act." Note that Conrail was sold in 1997 to the Norfolk Southern and CSX corporations, which beginning in 1999 assumed operation of most Conrail lines and facilities. Conrail today manages and/or operates lines in New Jersey, as well as in the Philadelphia and Detroit metro areas, primarily providing local switching and terminal management services. The Conrail website refers genealogical researchers to the Railroad Retirement Board. Official seniority rosters typed up by division have survived, many in the hands of former employees and private collectors. For an example of these, see the 1941 clerical indexes above. There also appear to have been a number of privately-published listings of employees that were produced by local printers. These, like the Hornell Shops and Kent Division rosters presented on this site, were popular with employees and advertisers as well. Other publications centered around crafts or unions and their members. An example of a book fitting in this category is "American Locomotive Engineers, Erie Railway Edition," which is indexed on this site. Some of these items are available through rare books dealers. As of this writing, few have found their way into public archives. A portion of the archives for the Erie-Lackawanna reside at the University of Akron. The archives of the Erie Lackawanna Historical Society are located at the Buffalo Heritage Discovery Center. Both archives have a large selection of corporate artifacts and documents of interest to the serious Erie researcher. You may wish to check with the archivists if you have any specific research needs. Finally, Fred Stratton has on his website an Erie Lackawanna Employee Hall of Fame. Anyone with family members who worked for the EL, the Erie or the DL&W railroads can email the names, railroad and years of service, and Fred will post them on the site. For more information, click here. Please do what you can to preserve the memory of the Erie and the people who worked there! All data on this site (C) 2001-2018, James Sponholz, Milwaukee, WI, unless otherwise indicated. These electronic pages may NOT be reproduced in any format for profit or presentation by any other organization or persons without prior permission.